It’s easier than ever these days to squeeze in some reading on the move via an assortment of modern gadgets. Sterling recent work on responsive styling means that WordPress is often the delivery platform for much of this content. There are times though when an audio experience is what required. Maybe you’re looking to make the most of your drive to the office, or want to exercise your mind while working out. 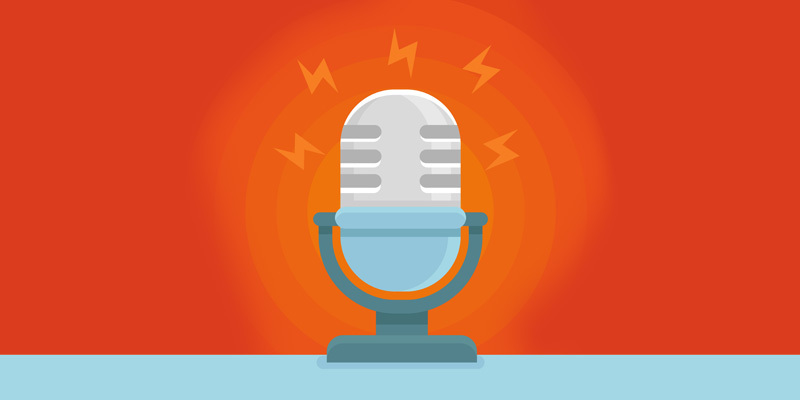 In the last five years podcasting has emerged as a fully fledged medium in its own right, with a huge amount of podcasts springing up that cover every conceivable topic. In this article we’ll concentrate on the best WordPress related podcasts out there to help you make the most of your listening time. 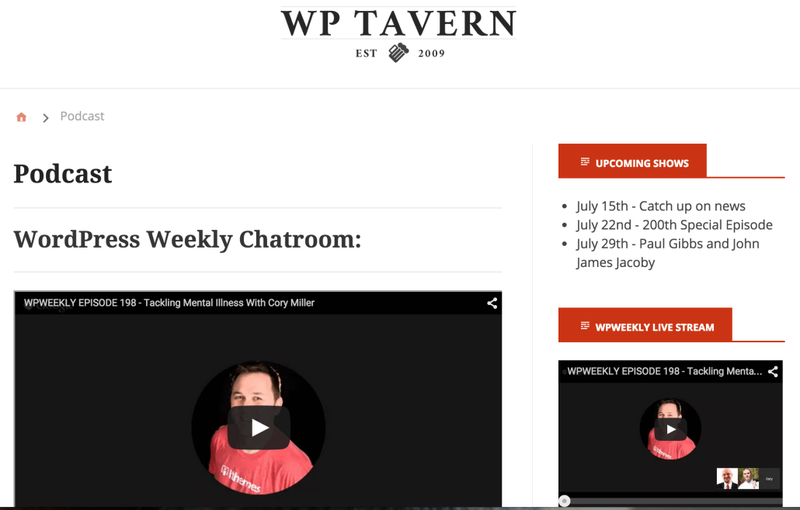 WP Tavern should be a go-to resource for anyone remotely interested in WordPress. Its constant stream of informed and impartial commentary on the WordPress ecosystem has made it a must-read site in recent years, and its WordPress Weekly podcast content keeps the quality bar equally high. Jeff Chandler helms the show that generally clocks in around the hour mark and has attracted a consistently high calibre of guests throughout its existence. It’s definitely one that should be near the top of your weekly listening queue. Episode 190: Women in WordPress Roundtable is a great intro to the podcast. A serious topic tackled in depth with an expert and engaging panel. Matt Madeiros has been churning out regular podcasts aimed at small business owners and WordPress agencies since 2012 at The Matt Report. Alongside the excellent standard of audio content, there’s also a pro version of the podcast available with additional exclusive material and a fledgling set of forums for listeners to engage with. The first in a four part series, 3 Critical Phases of the Discovery Process covers all aspects of the redesign of an already successful eCommerce site. Don’t let the clunky title put you off – it’s a fascinating real-world walkthrough with actionable takeaways for all. Long-term users of WordPress will be painfully familiar with the fact that mastering the software requires paying attention to a terrifyingly large set of minor moving parts. 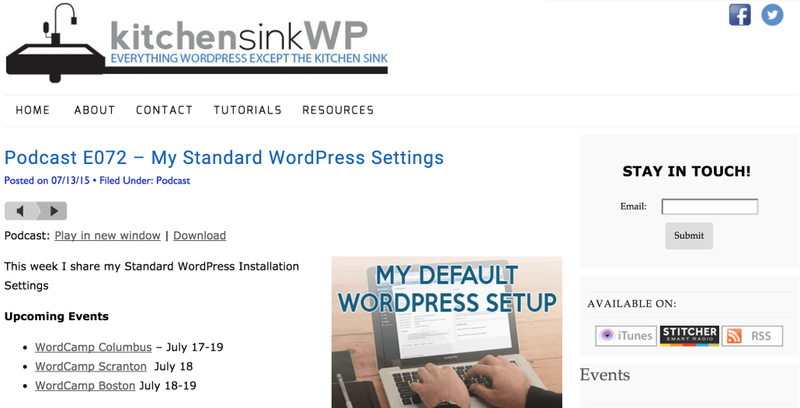 KitchenSinkWP is a great resource for site owners of all experience levels, as it focuses on the nitty-gritty of actually getting stuff done in WordPress and is packed full of useful tips, tricks and tutorials. Not every client relationship pans out long term and The Business Breakup is a fascinating look at what happens when a client turns their back on both the platform and your services. WordPress users at the more technical end of the spectrum will be pricking up their ears with interest at the thought of a podcast dedicated exclusively to matters development related. WP Dev Table is only a few episodes into its run, but is already delivering excellent value for those who code for a living. Varying Vagrant Vagrants & WordPress In Universities with Jeremy Felt goes deep on real-world concerns such as getting your development environment dialed in and successfully automating deployments. Another one for the more technically inclined, Apply Filters isn’t afraid to roll up its sleeves and tackle detailed WordPress development topics in depth. It also contains hours of content directly relevant to business owners, and a number of excellent in-depth interviews with experts from across the WordPress world. Transitioning from developers to business owners will resonate with many developers. It tackles how best to manage the journey from being primarily a developer to taking up the reins of an actual business. Having passed the fifty episode mark, Carrie Dils’ weekly Office Hours podcast is building up quite the archive of engaging WordPress related audio. 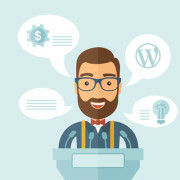 Topics discussed range across all areas of the WordPress ecosystem, with a healthy focus on practicalities evident throughout and great interviews with an array of developers and business owners. The Digital Content King is an interesting interview with Jerod Morris of Rainmaker.fm on how to manage all aspects of online content workflow. We’ll round out our selection with a podcast orientated around commercial WordPress matters in WP Elevation. Troy Dean’s main site offers a variety of paid solutions to help you develop as a WordPress consultant and the podcast backs this up with a great free content on related topics. Ross Johnson is a deep dive with Ross Johnson of 3.7 Design. Running a successful WordPress based-design business and building out products is a path many WordPress users are actively pursuing and this episode pulls back the curtain on building a WordPress business. That just about wraps it up for our choice of WordPress related podcasts that you should be adding to your listening queue. For a simple and enjoyable way of broadening your WordPress knowledge, it’s hard to beat podcasts. As our list above shows, it’s incredibly easy to find high quality, detailed info on every aspect of the WordPress ecosystem from development to marketing – and all available for free online in podcast format. We’d love to know which podcasts on our list you’re already tuned in to and whether we’ve missed out on any you regularly listen to. Get in touch in the comments below and share your thoughts! Thanks so much for the include here! 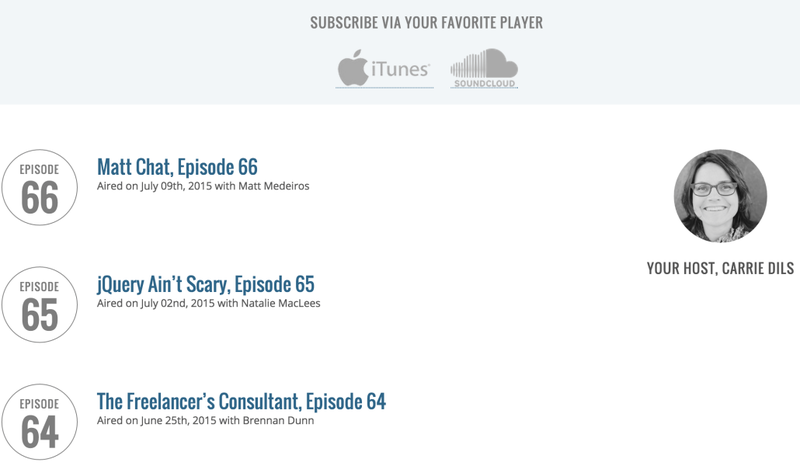 I love the addition of the “Take a Taster” – very helpful way to introduce folks to a podcast. Great list – these WP publications are definitely worth a read!